Take your first step toward a successful career in medical coding with in-depth coverage from the most trusted name in coding education! 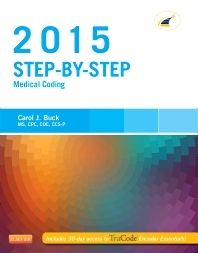 From Carol J. Buck, Step-by-Step Medical Coding, 2015 Edition is a practical, easy-to-use resource that shows you exactly how to code using all current coding systems. Explanations of coding concepts are followed by practice exercises to reinforce your understanding. In addition to coverage of reimbursement, ICD-9-CM, CPT, HCPCS, and inpatient coding, this edition fully covers ICD-10-CM in preparation for the transition to ICD-10. No other text on the market so thoroughly covers all coding sets in one source! A step-by-step approach makes it easier to build skills and remember the material. Dual coding addresses the transition to ICD-10 by providing coding answers for both ICD-10 and ICD-9. Over 500 illustrations include medical procedures and conditions that help you understand the services being coded, and images from Carol J. Buck's professional ICD and HCPCS manuals that familiarize you with the format of professional coding manuals. Real-life coding reports simulate the reports you will encounter as a coder and help you apply coding principles to actual cases. Complete coverage of ICD-10-CM prepares you for the transition to ICD-10. A workbook corresponds to the textbook and offers review and practice with more than 1,500 questions, activities, and terminology exercises to reinforce your understanding of medical coding. Available separately. Official Guidelines for Coding and Reporting boxes allow you to read the official wording for inpatient and outpatient coding alongside in-text explanations. Four coding question variations develop your coding ability and critical thinking skills, including one-code or multiple-code answer blanks. From the Trenches, Coding Shots, Stop!, Caution!, Check This Out!, and CMS Rules boxes offer valuable tips and helpful advice for working in today’s medical coding field. Coder’s Index makes it easy to quickly locate specific codes. Appendix with sample EHR (Electronic Health Record) screenshots provides examples similar to the EHRs you will encounter in the workplace. Exercises, Quick Checks, and Toolbox features reinforce coding rules and concepts, and emphasize key information.